Adm. Mayfield died Wednesday at Baptist Hospital after a long illness. He was 59. Adm. Mayfield retired from the Naval Reserve in January 1982. Until his -retirement, he was project director of Reserve Cargo Handling Forces for the Navy. He was awarded the Legion of Merit for outstanding performances in this capacity. He enlisted in the Navy in 1942, became a radioman first class and participated in several South Pacific invasions. He was selected for officer training in the Navy’s V-12 program at the University of Southwestern Louisiana in Lafayette and returned to the United States in June 1944. 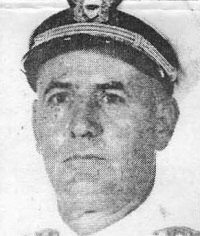 He was transferred to the Naval Reserve Officers Training Corps at Tulane University in 1945. He was commissioned in the Naval Reserve and rose from ensign to rear admiral. He held four different commands spanning 20 years of his almost 40 years of service. At the time of his death, Adm. Mayfield was senior vice president of the First National Bank of Commerce in New Orleans. Before that, he was senior vice president of Hibernia National Bank, where he began his banking career upon graduating from Tulane University’s business school in 1947. He was a member of the first graduating class of “School of Banking of the South” at LSU in 1952. He was a director of the Louisiana Bankers’ Association; past president of the National Institute of Credit, New Orleans Chapter, and a member of the American Institute of Banking. Adm. Mayfield was past chairman and a member of the Military Affairs Committee of the City of New Orleans, former director of Big Brothers of New Orleans, and a director of International House. He was also past president of the Junior Chamber of Commerce, the Greater New Orleans Council Navy League, the Naval Reserve Association -Acadian Chapter, the Navy Supply Corps Association, and the Navy Supply Corps Foundation. He was also a member of the Tulane Association of Business’ Alumni, the New Orleans Chamber of Commerce, Propeller Club, Information Council of the Americas., Reserve Officers Association, Naval Enlisted Reserve Association, Veterans of Foreign Wars, Plimsoll Club and the Royal Order of St. George. He was a former member of the Press Club and the Pendennis Club. Adm. Mayfield was a member of St. James Major Catholic Church. He is survived by bis wife, Mary Ellin Voizin Mayfield; a son, David Mayfield; a daughter, Martha M. Otness of Denver; his mother, Bertha S. Mayfield Wallace of Mt. Pleasant, Texas; three brothers, Winifred of Tyler, Texas, Harmon Jr. of Mt Pleasant, and James Mayfield of Laurel, Miss. : a sister, Charlotte M. Decker of Eugene, Ore., and two grandchildren. Military funeral services for retired Rear Adm. Charles Herbert Mayfield will be held at 11 a.m. Saturday at Lake Lawn Metairie Funeral Home Chapel. Interment will be in Metairie Cemetery.